Fun Leaf Fairy Costume features Green Dress with Hemp leaf and Tulle, wings, Wand and Headpiece. Garden Fairy Adult Costume.Includes: Fairy dress with silk flowers, bodice lace ups and flower hair ties. Available Size: Womens - Small/Medium (4-8), Womens - Medium/Large (10-14). (See Size Chart For More Information) *Wings and Shoes Not Included. Accessories Sold Separately. Features brown Garden Fairy dress with silk flowers and bodice lace ups. Amazing Product! Try it. Midnight Fairy Costume features Velvet Dress with Net Apron, Belt Shoulder Pieces and Deluxe Fairy Wings. Look just like a pixie fairy in this Pixie Dust Fairy Adult 3pc costume featuring green petticoat halter dress with metal stud detail, magic star wand, and antennae headband. Spider Web Fairy Adult Woman Costume, this includes the dress, headpiece, sleevelets, and the wings. 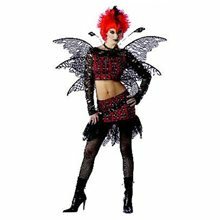 Punk Fairy Adult Women Costume;Punk Rockin Fairy Adult Costume includes Rockin Poly Top With Mesh Sleeves, Skirt With Mesh Ruffle, Matching Choker, Belt And Wings. Rock the mic this Halloween costume party in this hot fairy costume. Bang your head in this punk rockin fairy adult costume. You will look like a rock star in this punk rock fairy costume. Buy and fly away with this fun and awesome adult fairy costume.